Mai Allah Wasai Sindhi Classical Music Singer. She was great Artist of Sindh she has sung Sindhi Lok Music, Sindhi Sufi Music. She was sung great songs with his own style with great Classical Mousiqui of Sindh. She was legendary Artist of Therparker Sindh. She stared singing in the marriage functions of local areas in Therparker Sindh iand other jurisdiction of Sindh. Her great voice was admirable in Sindhi Classical Music. Mai Allah Wasai was great and popular Singer and peoples of Sindh listen still her old songs. She create great name Sindhi Music. She has sung Sindhi Sufi Music, and she was most popular Singer of Radio Pakistan Hyderabad and Pakistan Television. Sindhi peoples never forget Mai Allah Wasai. I have selected below most popular Sindhi songs of Mai Allah Wasai. Mai Allah Wasai was sung the poetry of Hazrat Shah Abdul Latif Bhitai R.A, Hazrat Sahib Dino Shah, Hazrat Sachal Sermast R.A, and other popular Sindhi poets. Mai Allah Wasai sung in open Mehfils, Mela and Shrine of Sufi Buzrigs in Sindh. Her style in singing and her sweet sound like peoples of Sindh. 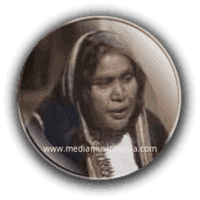 Mai Allah Wasai specially sung a song in old style in the Grassroots areas of Sindh territory of Therparker Sindh and other local areas and she also sung Sufi Songs.